Maximum size: about 76 mm. Identification: This species has a nearly transparent body decorated with brown flecks and cream patches. The cerata are smooth to weakly papillate and slender with long, horn-like branches extending from their tips. The branch tips range from transparent to red-brown or blue. (Note 1) The notum and oral hood have scattered elongate papillae and the rhinophores are slender. Natural history: Melibe megaceras appears to be a rare species on Maui--we've never seen it and we know of only two records. However, Gosliner (1987) reports that it may be seasonally abundant on shallow sand flats on Oahu where it typically rests with the cerata spread flat against the sand. The Maui records were of a drifting animal and one found on sand at about 8 m (26 ft). It may derive much of its nutrition from symbiotic zooxanthellae (Symbiodinium microadriaticum) that it retains in its tissues. (Kempf, 1984) (Note 2) Like most Melibe spp, it can swim by lateral flexing, if disturbed. It lays a small, tightly-coiled, cream egg mass. Taxonomic notes: It was first recorded in Hawaii from Kaneohe Bay, Oahu by Terry Gosliner on July 3, 1981. Photo: Daniel Jennings-Kam: 52 mm: found in HIMB sea tanks, Coconut Island, Oahu; July 18, 2012. Note 1: Presumably, differences in transparency are due to variation in the density of zooxanthellae in its tissues. However, variation in the color of the branch tips might reflect retention of different pigments from the animals it eats. Note 2: The typical posture of these animals while resting on sand may have evolved to maximize exposure of the zooxanthellae to light. However, to a human eye, resting animals look much like the swimming anemone, Boloceroides mcmurrichi, (a species that is also common in the same habitat) with the long, branched cerata resembling its tentacles. Mesacmae sp. 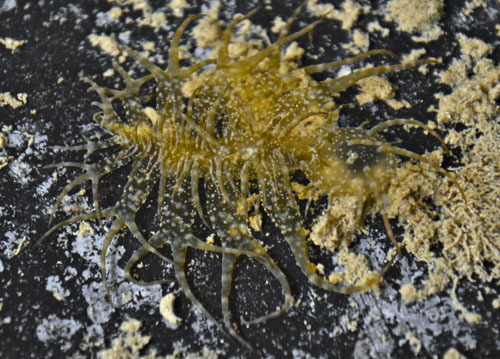 and at least one other unidentified, sand-dwelling anemone are also similar in appearance. So, perhaps, the form of the cerata evolved as mimicry?